Affordable, fun, and offering a distinctive and atmospheric sound, you won't regret chilling out with Frostbite. Versatile effect. Nice sound. Quick and easy interface. Order-switching tabs. Randomise function. No wet/dry lock. Could offer more performance controls. AudioThing recently impressed us with Phase Motion, its take on the classic phasing effect. 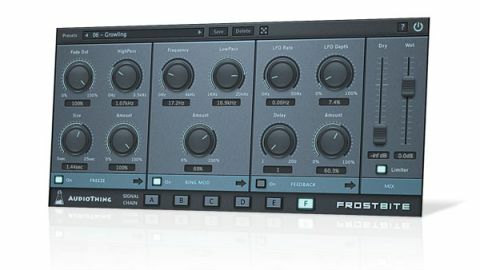 For its latest plugin, the firm has combined three processors in one powerful unit. Frostbite (VST/AU/AAX) merges Ring Modulator and Feedback modules with a convolution-based Freeze effect. The Ring Modulator has three controls: Frequency sets the frequency of the modulation, Low-pass attenuates high frequencies (the lowest setting is 1kHz), and Amount is a dry/wet control. It's a classic ring modulation effect that works well enough on its own - but it's at its best in conjunction with its siblings. "Frostbite was designed with ambient and cinematic music in mind, but it's actually far more versatile than that"
Feedback produces a flanging-style effect (though a bit more stepped and pleasingly rough), defined using four controls. LFO Rate and LFO Depth control the modulation, while Delay sets the Feedback intensity and Amount, again, establishes the wet/dry mix. Again, it's quite a cool process in its own right, but things really come together when you throw in Freeze. Though the section is called Freeze, this function is not, in fact, a conventional 'freeze' effect that captures a small slice of audio to loop. Frostbite's Freeze function is much more akin to a convolution reverb, constantly capturing the entire signal and convolving it with a set of samples (impulse responses) to produce more reverb-like results. The controls are simple: Size sets the freeze's duration (0-25 seconds), and Fade Out creates a smooth fade-out at the end of it. At long Size values, the fade-out is smooth, but at very short times, it has more of a softening effect. The High-Pass control filters out everything below anywhere from 0-3.5kHz, enhancing Freeze's usability by preventing it from swamping the signal with messy bass and lower mid frequencies. The wet/dry mix is adjustable, once again, via the Amount control. The Mix section comes last, with its Wet and Dry sliders and optional Limiter on the output. This last is worth leaving on when experimenting with the plugin, as levels can get hot quickly. Programming Frostbite is simple and easy, but 15 presets are included to get you started. That might not sound like a lot, but they offer plenty of starting points. Additionally, the tabs at the bottom of the interface switch between different signal flows, effectively multiplying the number of presets by six; and there's also a randomise button for instantly generating new patches. Frostbite was designed with ambient and cinematic music in mind, but it's actually far more versatile than that. It's difficult to describe the sounds it makes in words, but they range from extreme modulation to positively icy reverb tones. It can also be used as a more subtle ambience effect, for extreme breakdown builds, and potentially as a simple mixing tool, thickening a signal and giving it more distinction in the mix. There are a couple of things we'd like to see added, though. A Dry/Wet slider lock option would help when flicking through presets or using the Randomise button; and while we're on it, randomisation of individual modules would be warmly welcomed, too. As it stands, Frostbite is a solid and useful plugin for most styles of music. The core effects aren't particularly original, but the way in which they're combined is uncommon, making them surprisingly versatile as a collective, and capable of producing sonically impressive results.